-An excellent set that will decorate your home! -A set of cutlery is made of pure 925 silver. -It can become a beautiful family asset. -The exceptional quality of this set will not leave indifferent lovers of beauty. -All products are made for you personally. The manufacturing time varies from 7 to 16 days, the delivery of the order is carried out for 2-4 weeks. Master of jewelry with experience of 46 years, who is a jeweler in the fourth generation, makes silverware specifically for you, using centuries-old techniques and traditions of Russian jewelers, combining them with the most advanced technologies. He with special attention and diligence makes every detail, bringing the product to perfection. All products are made for you personally. The manufacturing time varies from 7 to 16 days, the delivery of the order is carried out for 2-4 weeks. This magnificent coffee set is made in accordance with the old traditions of jewelry mastery. Surprise your guests by serving your lovely coffee in this exquisite dish. Cup size: height - 55 mm, diameter - 50 mm. The volume is 70 ml. Saucer: diameter - 90 mm. Spoon: length - 105 mm. Approximate weight of the set is 900 grams. Coffee cups inside are covered with 585 gold. !! !Non-refundable Law Export country no Silver Return!!! Car boot sale ad details Silver Coffee Set,6 People, Sterling Silver 925, Cups, Gold 24carat for sale in London. 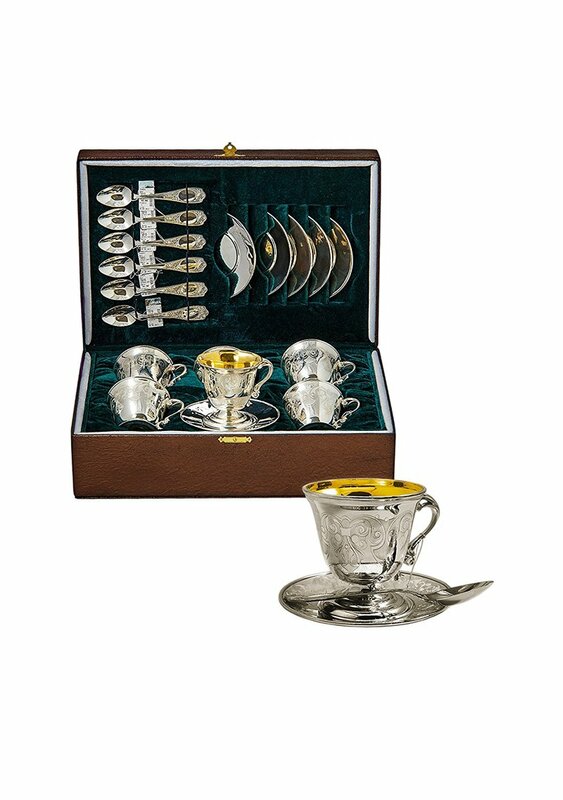 Silver Coffee Set,6 People, Sterling Silver 925, Cups, Gold 24carat available on car boot sale in London. More Kitchen & cooking for sale in London and more second hand sale ads for free on 2lazy2boot - London car boot fairs - 39370.